It occurred to me that perhaps after my last several posts, I should lighten things up a bit. I’m also constantly on the lookout for healthy entrée salads for some of my clients and wanted to try this Pad Thai Salad out. Glad I did. It was the surprise hit of the week (and much needed after lasagna, meatloaf, and queso gravy!). It also did something I thought might be impossible…it got my husband to willingly eat zucchini! Bonus! So I know I clipped this recipe within the last few week, but after several internet searches I simply could not find the source for this dish (I’ve got to get better at writing the magazine’s name on the pages I tear out!) Even though no credit can be given I know for a fact I’ll be making this many, many times. I’m also looking forward to tinkering around with it a bit – adding more veggies and switching things up. The dressing has a nice zip to it and there’s a welcome chew from the noodles so it doesn’t seem like your just eating a bowl of raw veggies. It’s one of those dishes that you just keep picking at, eating another bite when you think you’re done. But since it’s basically all veggies — go ahead and take another bite or two! Another strange thing about this recipe is that it says it serves 3. What recipe have you ever seen that says it specifically serves 3? But you know what, we had leftovers after hubby and I had lunch. Using a vegetable peeler, cut zucchini and carrots into long strips. Cook noodles according to package directions; cool slightly. In a blender or food processor, purée olive oil, almond butter, tahini, syrup, tamari, lemon juice, garlic, cayenne and 4 Tbsp water until smooth. 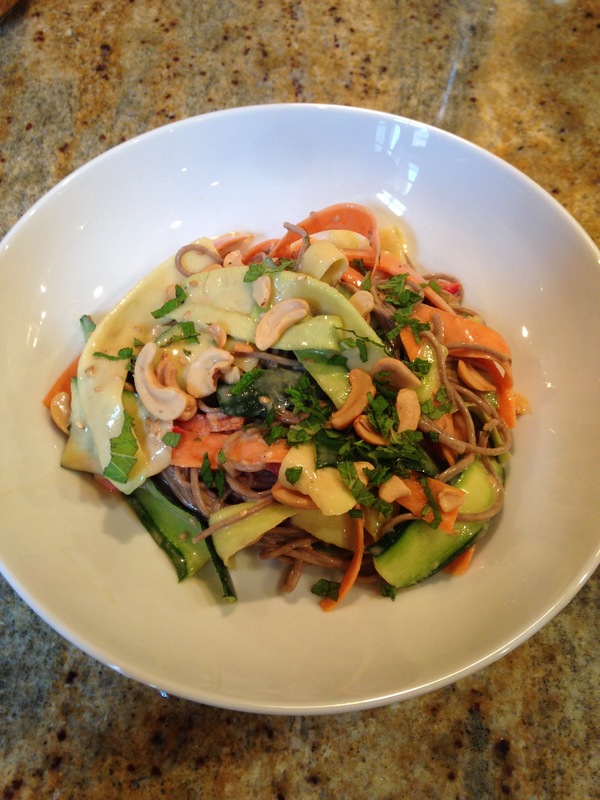 In a bowl, toss zucchini, carrots, noodles, red pepper, sesame seeds and cashews with dressing to combine. Divide among 3 plates; garnish with mint. I dearly love lasagna. Any kind of lasagna. You can put sausage, ground beef or even chicken in it. It lends itself to a myriad of vegetables and really any type of cheese you can imagine. But, what if you stripped it bare? No meat, no veggies, no distractions. Just layer after layer of pasta sheets bathed in a simple bechamel that’s been fortified (literally and figuratively) with some booze (in this case Marsala). What happens then? Magic, I tell ya. Sheer and utter magic. 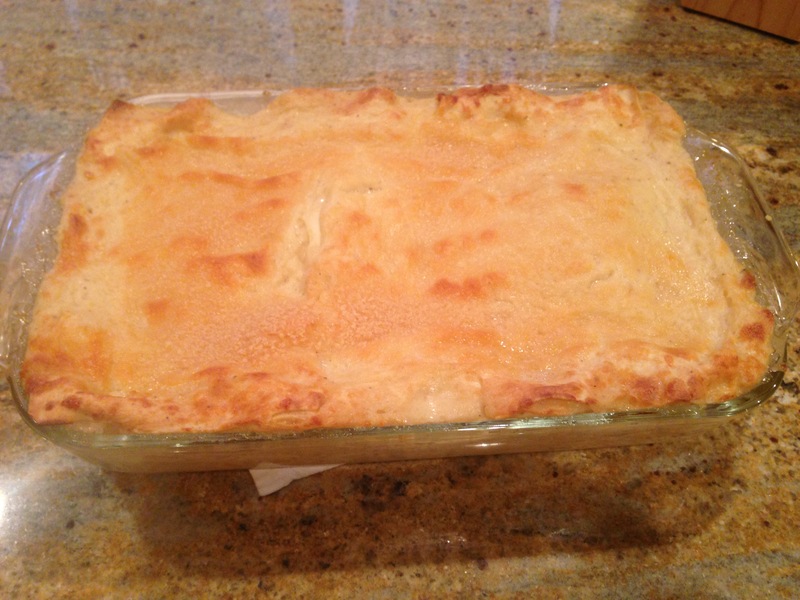 I pulled this recipe for Lasagna in Bianco ages ago from Gourmet Magazine (just the fact that there was a Gourmet Magazine gives you a hint as to how long ago). I have made this before but for whatever reason, it did not make it as a Weekly Winner. All I can say is that must have been one heck of a week meal-wise if something else beat this out. And yes, I realize it does have Parmesan cheese in it, but compared to most lasagnas, not much and most of it is on the top. You’ll have to excuse the picture. Apparently when you strip a lasagna of everything that is not beige it does lack something in photographic appeal. But trust me, it lacks nothing in pure pasta wonderfulness. Cook shallots in butter in a heavy medium saucepan over medium heat, stirring occasionally, until tender, about 4 minutes. Add flour and cook over low heat, stirring with a wooden spoon, 3 minutes. Add nutmeg, then slowly whisk in milk and stock. Bring to a boil, whisking, then simmer, stirring occasionally, just until sauce lightly coats back of spoon, about 1 minute. Remove from heat and cool to warm, stirring occasionally. Stir in eggs, Marsala, sea salt, 1/2 teaspoon pepper, and 1/2 cup cheese. Spread about 1 1/4 cups sauce over bottom of an 11- by 8-inch baking dish. Cover with a layer of 3 lasagna sheets. Repeat layering 3 more times, then top with remaining sauce and remaining 1/2 cup cheese. Bake, uncovered, until browned, 45 to 55 minutes. Luscious. Simply Luscious. There is no other way to describe this strange little dish. You have wonderfully soft, spiced meatballs nestled on white rice and then it all is bathed in an amazing yogurt sauce that’s been enriched with egg yolks. 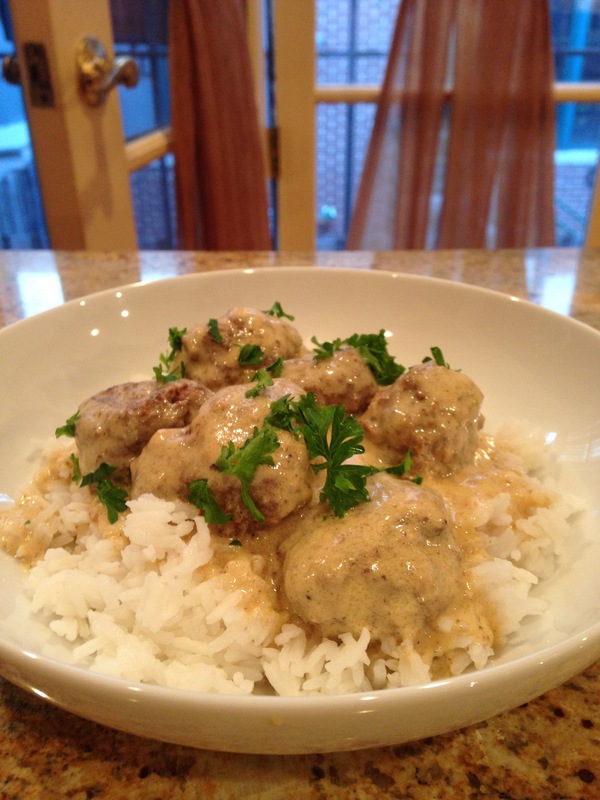 Because it’s basically meatballs in a “white” sauce, there is a definite homage to Swedish meatballs. But this dish is far more complex and interesting than the cocktail party staple. Spiced Meatballs with Yogurt Sauce comes from Martha Stewart Living. It takes more time than you’d expect to make this dish and has a few unexpected steps, but nothing is complicated or difficult. The results are definitely worth it when you sit down to this rich, satisfying dish. In a large straight-sided skillet, heat 2 tablespoons oil over medium-high. Add onion, minced garlic, and 1 1/2 teaspoons salt; cook, stirring, until translucent, about 3 minutes. Add cumin and cinnamon and cook, stirring, about 1 minute more. Transfer mixture to the bowl of a food processor; process to a paste. In a bowl, combine breadcrumbs and 1/4 cup broth; let stand 5 minutes. Add beef, onion paste, whole egg, and cilantro; mix with your hands to combine. With lightly dampened hands, form mixture into 28 balls, about 2 tablespoons each. Heat remaining 2 tablespoons oil in skillet over medium-high. Working in batches (do not crowd pan), cook meatballs until browned on all sides, about 7 minutes a batch. Transfer to a plate; pour off fat from skillet. Return meatballs to pan; add 3/4 cup broth and sliced garlic. Bring to a boil, then cover, reduce heat to low, and simmer just until meatballs are cooked through, about 6 minutes. Transfer meatballs to a plate with a slotted spoon. In a bowl, whisk together egg yolks and yogurt. In another bowl, whisk together cornstarch and remaining 1/4 cup broth; whisk into broth in skillet. Bring to a boil, whisking constantly, then strain through a sieve into yogurt mixture, stirring to combine. Return to skillet and cook over medium, stirring constantly, until just bubbling and thick enough to coat the back of a spoon, about 1 minute; season with salt. Add meatballs to sauce and heat through. Serve over rice, sprinkled with sumac, red-pepper flakes, and parsley. 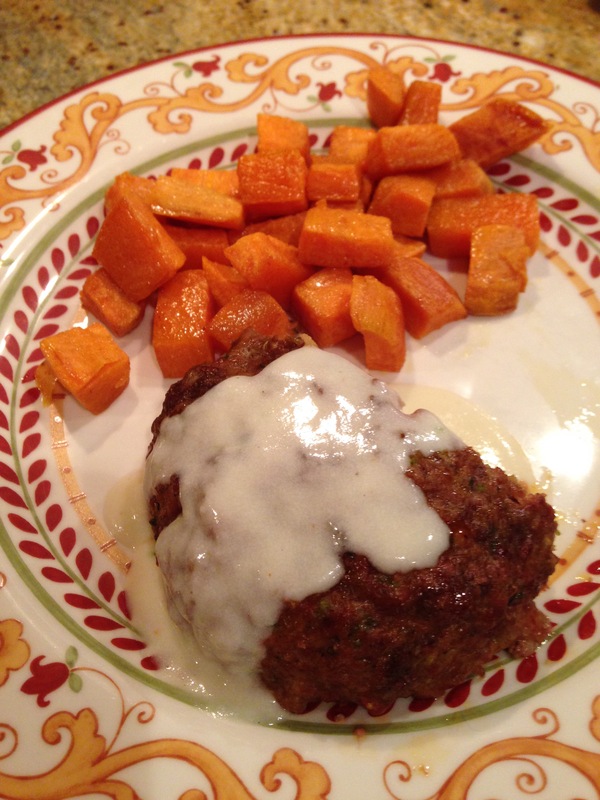 Weekly Winner: My new-found meatloaf fixation turns south…. Of the border, that is. As this will be my fourth meatloaf entry, I guess it’s safe to say that I am no longer ambivalent about meatloaf. I now seem to always be on the lookout for an interesting take on the everyday “loaf of meat”. This latest discovery had two major points in its favor. One, my husband was born in Albuquerque and has a deep and abiding love of chile peppers, so when I saw that this had poblano peppers in it — score one for the meatloaf. Then, there is the Queso Gravy. Excuse me??? Cheese Gravy???? Game, set and match – meatloaf! South-of-the-Border Meatloaf with Lime Queso Gravy was an absolute triumph. The meatloaf itself was great, but then you add the queso gravy and … Um, yeah…. Home run. Another great thing about the recipe is that it is designed to make individual “mini” meatloaves. There is something supremely satisfying about sitting down to your own meatloaf. No sharing! Not that you can’t turn any meatloaf recipe into individual mini-meatloaves (trust me, I have!) but it’s just nice that they start out this way so there’s no tinkering with timing or oven temperature. If there is a problem with this recipe, it’s that I have no idea where this one came from. I can’t seem to find the source anywhere. Regardless, it’s a keeper! Did I mention the cheese gravy?? I mean, seriously!! Whisk together 3/4 cup milk, eggs, 1 Tbsp salt, chili powder, black pepper, oregano, cumin and coriander. Add bread and mash together with a fork. Combine ground chuck, ground pork, minced onion mixture, and bread mixture. Divide meatloaf mixture into six equal portions, shape into mini loaves, and arrange on prepared baking sheet. Cook meatloaves until an instant-read thermometer inserted into the centers registers 165F, about 35 minutes. Let meatloaf rest about 10 minutes while making gravy. Melt butter in a saucepan over medium heat. Whisk in flour; cook 2 minutes. Slowly whisk in 2 cups milk until smooth. Bring mixture to a boil; reduce heat and simmer 5 minutes. Off heat, whisk in cheese, lime juice, and zest until cheese melts; season with salt and cayenne. Weekly Winner: This Dish is Like “Buttah” — Indian Butter Chicken that is. I’ve made Butter Chicken before. I dearly love Butter Chicken. Whenever I go to an Indian restaurant, I am hard-pressed to not order Butter Chicken. 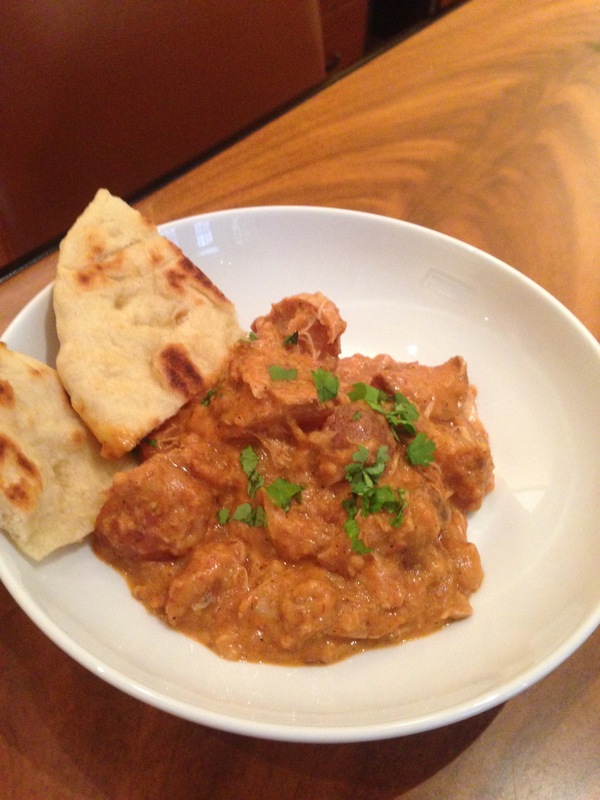 I’ve even written about the dish before in this very blog (Murgh Makhanwala) However, as of this week, I have destroyed that recipe and am replacing it with this one – Slow Cooker Indian Butter Chicken. Not only is this one tastier, it’s a whole lot easier. It’s one of those miraculous slow cooker recipes that you literally dump everything in, set the timer, and walk away. You don’t even need to make rice as it has potatoes right in the dish! Truly a one-pot-wonder! If you are lucky enough to have a husband that makes spectacular naan, then even better!! If not, I’m sure store-bought naan would do nicely. I wouldn’t know — I have one of those aforementioned husbands. This new and improved recipe comes from Food Network Magazine. It couldn’t be simpler or yummier. No overnight marinating, no cutting up chickens, just chop, drop, stir and eat. Obviously, I left out any semblance of cilantro (except for my husband’s dish and the photo-op, which I begrudgingly sprinkled some on). I have no idea if it’s as authentic as my previous post but truth is, I don’t care. I like it and it’s simple enough that I can and will make it on a regular basis. Crumble 1/2 piece naan into coarse crumbs; transfer to a 6-quart slow cooker. Add the red onion, potatoes, chile and cilantro stems. Arrange the chicken thighs in a single layer over the vegetables and sprinkle with the garam masala, 3/4 teaspoon salt and a few grinds of pepper. Dot with the butter and add the cinnamon stick. Pour the tomato sauce over the top. Cover and cook on low, 7 hours. Uncover and switch to the warm setting or turn off. Gently stir in the heavy cream, breaking the chicken into large chunks; let stand 10 minutes. Stir in the cilantro leaves and season with salt. Serve with the remaining naan.